For those who like to get lost, nothing beats working your way through a maze. I started drawing mazes in the mid-70’s and quickly developed my own style which hasn’t changed since. I used to draw alot of them, most of which were given away or claimed by my mother, but the last one I drew was in 1996. Most of the mazes I have are available for downloading here. All of my mazes are hand-drawn and include a couple of features that are designed to make going through the maze alot harder than usual. The first feature is the bridge. This lets one path cross over or under another path without connecting to it. It adds a bit of 3-dimensionality to the puzzle. Bridges are drawn similar to the way they would appear on a roadmap. The start and finish areas of each maze typically have a few different entrances and exits, any one of which may work. In general, all the entrances are interconnected to each other somehow and the same holds true with the exits. Paths generally tend to lead back to where you’ve been before. I draw each maze by working from the start and finish at the same time, keeping track of which paths lead from the start and which paths lead to the finish. Somewhere along the line, I connect a start path and a finish path. This tends to make the maze as difficult to solve working backward from the finish as it does forward from the start. I also try to use a little ‘psychology’ when drawing my mazes, trying to lure you away from the correct path. But it doesn’t always work for everyone. Back in my maze-making heyday, I made several very large mazes, the largest of which is the Mammoth Maze 5. I drew it in 1981. It is over 20 square feet (roughly 3×7.5 foot) and contains almost 1/4 mile of paths! Click on the image for more information about this maze and how to buy a copy. Most of the mazes that are available for downloading here are fairly small. The originals were done on letter or legal size paper (some with a little color for a more artistic look) and were scanned in black & white (typically at 200 or 300dpi). The scan quality isn’t the best but the mazes are do-able. Still, the bitmap size is quite large (over 2000×3000 in GIF format) so if you decide to download one or more, you should print them out first instead of attempting to do them on your screen. Use a program (such as Microsoft Photo Editor) that allows you to print the maze so it fits on one full-sized piece of paper. These were hand-drawn, then scanned in black & white (unless otherwise noted). These are intended to be printed out using a graphics program such as PaintShop Pro or Microsoft Photo Editor that can scale the image fit on one page. To download a maze, right-click on the thumbnail and select “Save target as…”. 8.5″x11″. Drawn in 1991. 265k. 8.5″x11″. Drawn in 1992. 144k. 8.5″x11″. Drawn in 1992. 157k. 8.5″x11″. Drawn in 1992. 159k. 9″x4″. “MAZE” Drawn around 1982. 103k. 6.5″x6.5″. “Doughnut Twist” Drawn in 1982. 192k. 7″x7″. “Big Burger” Drawn in 1982. 361k – Color. 19″x24″ (poster size image 3825 x 2928). Drawn December 1996. 646k. (Fairly difficult).This maze is also available in color from Zazzle.com. Click on the color version below to buy it. 8.5″x11″. An early, crudely drawn maze from 1978. This very easy maze should fit in your browser window. 152k. 8.5″x11″. Another early maze from 1978. Too easy. Fits in your browser window. 107k. 8.5″x11″. “Electronic Nightmare”. 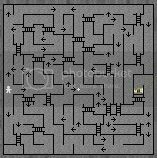 An easy maze using diodes – trace the conventional current flow (i.e. don’t go against arrows). Drawn in 1982. Fits in your browser window. 26k. 8.5″x11″. “Snake”. An early maze with a 5 minute time limit. First of a series of three. Drawn in 1979. 187k. 8.5″x11″. “Modern Art”. An early maze with a 5 minute time limit. Second of a series of three. Drawn in 1979. 216k. 8.5″x11″. “MX-365”. An early maze with a 10 minute time limit. Third of a series of three. Drawn in 1979. 214k. 8.5″x11″. “Lenses”. An early maze drawn in pencil. Drawn in 1978. 313k. NEW 4″x4″. “One”. A fairly easy maze I did for my company newsletter. First complete maze I’ve drawn since 1996. Drawn 2014. 101k. NEW “Two”. This is my first ‘two-in-one’ maze. Find your way from start to finish, then find your way from finish to start. Drawn 2014. 415k. NEW “Three”. This is a ‘six-in-one’ maze. There are three openings, labeled 1, 2, and 3. Pick one as a start and another as a finish and find your way through. There are six possible combinations, meaning six different ways you can find your way through. Drawn 2014. 495k. Wow! I love these mazes. Big Burger is definitely a new favorite of mine. Did you publish that 1982 Maze Calendar? Thats not a bad idea – I’ve been wondering what to do with my own mazes. Feel free to check them out – they’re at http://www.mazedojo.com ! Nope. I didn’t get far with the calendar. I’ve always had a hard time finishing things I’ve started. I checked out your site. You have some very nice looking mazes. I added your site to my maze links page. Have you done a maze showing the face of Jesus Christ? Hi, I work for a national magazine and we’re interested in putting a maze in our “games” section every issue (every 3 weeks). Your mazes are great and I think they’d be perfect for our needs. If you are interested in working with us, please e-mail me at (email address) and we can discuss the details. Thanks so much! These look like the mazes my mom and i did when i was a kid! my sister-in-law purchased them from a college student in south dakota – wonder if it’s you?? we did 4 such mazes between ’70 and ’74 – hope you are as my daughter loves mazes. No, sorry, that wasn’t me. I started drawing them in the mid-late 70’s, but I do remember seeing mazes like this in a magazine once, and that go me started drawing them. Perhaps those were drawn by the same student. The MAZE drawn in 1991 – do you have a solution for that one? I gave this one to Second Grade to try out, hope that is ok, and I think one little boy might have it. They are so very intrigued by mazes. I cannot believe they love most difficult ones! I’m trying to do something with the mazes I’ve been drawing, have you had any type of market for yours? I just had a friend of mine make a website for mine about 4 days ago (this is written on June 28th 2010). Anyhow, I was going to have him add a “Links” section, because the site is rather plain as it stands. Anyhow, I’m thinking you’ll say yes, but I’ll wait for your reply. (email address removed) http://www.aMazeKing.com Also, wouldn’t mind knowing what you think. I have two mazes on zazzle.com (one of which recently came up most popular when searching for “mazes”). But the amount of sales is so low as to be virtually nothing (i.e. one $25 check in many years). A color print can be expensive considering you only get a single maze. I think a better market would be through books, magazines, etc, but I don’t have the time to make enough mazes to do so. Some years ago I started working on a program to draw mazes in my style, but more ‘art-sy’, which would have been useful for books, mazagines, calendars, etc. While I know I can do it, I don’t have the time to finish it. Several years ago I made a maze for a Nancy Drew movie-themed placemat for The Old Spaghetti Factory chain. This was done on a spur of the moment request (i.e. less than one week). I used PowerPoint (!) to draw it and while I think it came out pretty good, I also think it was just a little too difficult for the intended age bracket (but I heard no complaints). I made more on this one job than on all the other mazes I’ve made combined. I’ve always thought mazes would make good restaurant placemats. Your mazes are awesome! I make mazes, too, and plan on making a web site for them. I just haven’t gotten around to it yet. your mazes are aMAZEing! I’m writing a book of mazes at the moment – including a six – page one I’ve just finished. I recommend Ben’s mazes. I’m ten. I want to say thank you for some really cool mazes! My 16-year-old nephew has aspergers & he LOVES mazes! I’m not sure he’ll be able to do these, but it’ll be interesting to watch him try! Do you have a book or other mazes? I would like to be able to get more if he is able to do these. You can email me at (email address) Thanks again. Happy New Year! Hi everyone, I just wanted to let anyone who is interested know that I am about to release a book of hand-drawn mazes. Please have a look at http://theologicallyamazed.webs.com/. It is a website to promote the sale of the book, which is also serving as a fundraiser given that I am preparing to move to Mozambique at the end of this year with my family as career missionaries. Please spread the word amongst the hand-drawn maze fraternity! Thank you. These will make my 6 year old granddaughter – who is good at mazes – really challenged. Is your maze calendar still available? No… I never finished it. Would it be alright if I used one of your mazes as the cover of the agenda/planner for my middle school? It’s not for profit and it would have an audience of about 350 students. Wyatt, you can use any maze except the Maze 96 or the Mammoth Maze. I thought i was the only one who did mazes this good, mine are not like yours but i make them uber detailed and pathways are smaller. if you would like to see any, send me an email at (email address) I was wondering if i could get some pointers or tips on what i should do with the mazes. Please can I use one of your mazes in an AQA Higher Project about how criticisms expectations and praise effect performance? I would be asking people to complete it- but only members of my school, and they would not be able to keep it after 3 minutes of trying to complete it. Not for profit or anything. Sure, you can use one of my mazes – any they can keep it if they want. Hey, I am an art director working for an advertising company, can anyone here help me with maze drawings, i want a particular style of maze drawings. plz help. money also we can discuss. love your style andrew! I’ve been drawing for 17 yrs since 7th grade study hall. Finally published book this fall and now working on names, business logos, greeting cards, and a calendar. check out Mazes of the Century! Only the first maze has a solution provided (see the link in its description) so you can see how the maze is done. I haven’t provided solutions for any of the other mazes. Wow…just wow. Those mazes are absolutely a-MAZE-ing! I would never have a steady enough hand, not to imagine the amount of patience those must take! Well done! these mazes are damn awesome!! they look sort of tough but i would rather say, they are interesting….thank you Andrew Bernhardt for all this awesome mazes…..!! I’m stumped on your flower maze from ’82. It looks like the middle path has no where to go. Is that just me? That is true. Not all of the start paths are guaranteed to make it to the finish, but at least one does. Andrew–I’m designing a poster for two friends who are putting up a sketch show. I really like your “Doughnut Twist” design and I’m interested in incorporating it in the design. Would that be OK with you? As long as you give credit, go for it! I am not working on a maze book. I don’t know where you got that idea. I would like to use one of your puzzles for a math club t-shirt design – with your permission. The one I would like to use is titled Doughnut Twist. Please let me know if that would be OK.
Sure, you can use that maze for a T-shirt design. Hi May i use this mazes to my new book? 7″x7″. “Big Burger” in this book and could provide us a high resolution digital image. Just wanted to say “Hello” and tell you, your Burger maze and Mammoth Mazes are awesome. I am also a “Maze Artist” and have a website, http://www.mazeman.com. It seems my past is similar to yours in that my maze drawing heydays were back in the 80’s & 90’s when I used to draw mazes almost every night. If you have a chance, please check out my website and let me know what you think. Good luck to you and keep on drawing! Hello, we are preparing a Christmas competition on our Facebook profile with riddle topic and I like to ask for your permission to use one of your maze for this. It is obviousness to write credit to you as the author and link to your internet page. Sure, you can use one of my mazes. Once upon a time, I played a browser game of a similar concept. Bridges and one-way doors. Navigate straight up/down/left/right and get your figure to the exit (portrayed by a money bill in this case). I got up to 15×15 and saved an image so I can “find it later”. Well… It turned out that’s not how you find the same website later. Years later, I’m still occasionally searching for it. During my free time, I’ve recreated it in Minecraft for a first-person experience. One that cought my eye was the “Electronic Nightmare”, which would be a nice 19×15 for recreating in this blocky game. —> I started writing this to ask for some smaller layouts or guidelines on how to make one myself. But I have a problem… Having no top-down view, people become discouraged and quit without really trying. I’ve tried not to make it claustrophobic. Paths are 5m (15ft) wide, sometimes varying. And I’ve added some decorations. Moss, creeks of leaking water from walls, some walls appear ruined, some one-way-doors are mechanisms that open up a wall and close it behind you. Different light levels, etc. People nowdays don’t have the patience to solve mazes. Afterall, there’s no risk for entering and there’s no real reward for completing it either. Just close the game if you’re bored. —> Have you ever made someone born after 1990 completey solve one of those mazes? If so, how did you motivate them? in the 1978 maze 2 is the stepped black line at the bottom suppost to be there as a barrier? ive done it ignoring that line but just want to check i hadnt cheated! p.s my brain really doesnt like these mazes thats why im trying to do them to make it work! Yes, the stepped black line as a barrier. recon ive cracked easy one and two! could do with someone checking it though as not sure about some of the one way arrows! Drawing the large mazes are fun to a point… It’s just the time that goes into making them. I’ve lost track of the time I’ve put into my largest maze. It’s 2ft by 30ft… I started sometime in the early 2000’s and I’m finally reaching the end of working on it. Things in life happened and I had to put it on hold for awhile. What’s funny is restarting it after the long pulse. I went throw what I drew years ago and wonder how I drew it. My style is similar with many layers that can be gone in any direction as long as it’s on the same layer. I never got into publishing anything. I was trying to build up a portfolio first but I never finished and everything has sat for years. On Facebook I started a page but never really did anything with it. On my personal Facebook page I post the progress of the large maze.